We just returned home from our third trip to visit Reesa's Krabbe specialist, Dr. Maria Escolar at the NDRD at Children's Hospital of Pittsburgh. Reesa is part of Dr. Escolar's study to track the progression of Krabbe disease in order to help future children affected with the disease. Dr. Escolar and her team were generally pleased with Reesa's health considering her age and length of time since she was diagnosed. Although Reesa vision has greatly diminished she is still able to detect bright, abstract colors. Reesa's hearing is very good. She also had a bone density test and will be put on special supplements to help prevent future fractures. They also preformed an MRI to track the demyelination process in her brain. We won't know the results for a couple weeks but Dr. Escolar was optimistic that things weren't progressing as rapid as some affected children her age. The most important thing is to avoid respiratory issues and to keep Reesa's lungs healthy. So far so good! Reesa was a perfect little girl the whole trip. She did great on both plane flights and during all of examinations. They were having issues with the MRI machine so Reesa had to sit still in the machine for almost 2 hours with no anesthesia. She was perfect girl and didn’t mind sitting around at all! As usual Dr. Escolar and her team were very knowledgeable and helpful in answering all of our questions. We finally met one of Dr. E's nurses Tara West (in-person) which we were really looking forward to. Tara has been an invaluable resource to our family over the last year. She is available day or night and has helped us during many urgent situations. We are unbelievably lucky and grateful to have her as part of Reesa's medical team. Some other good news; Reesa's leg is healing nicely and she will have her cast removed this week! It has been a while since our last update and for the most part things have been going very well. We've been taking Reesa out quite a bit lately to enjoy the amazing weather before its gets too hot. On the weekends, Reesa loves sitting on restaurant patios while Mom and Dad have lunch. We also had beautiful Easter brunch with Grandpa Jim, Houston and Kelsey. Unfortunately this past Monday we had a little setback. Reesa had a bad spasm while strapped in her stander and she broke her femur just above the knee. We had a hectic afternoon, evening and night at Phoenix Children's Hospital and the next day Reesa had her leg set and put in a cast. The doctor said she'll have the cast on for 4 weeks. 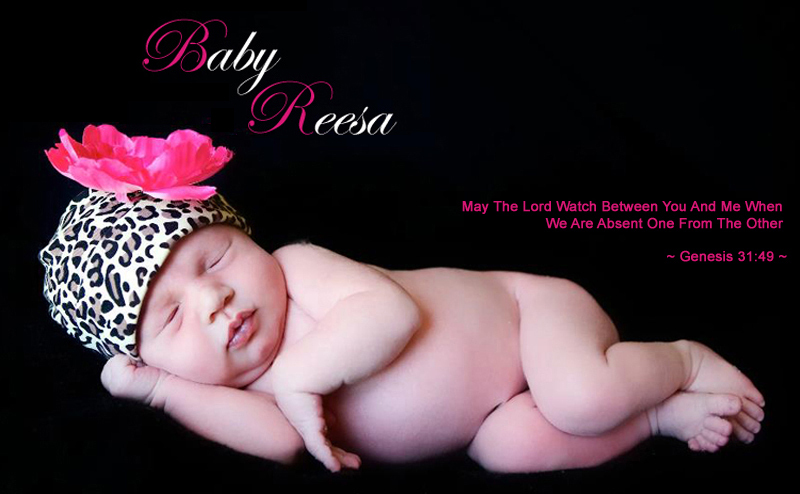 Since Reesa doesn't stand or walk her bones lack the density caused by weight bearing and gravity. She is going to do a bone density test when she sees Dr. Escolar in Pittsburgh in a couple weeks. Reesa has been strong, as always, and she's back home in good spirits.